Ballathie Country House Hotel and Estate is one of several statuesque properties that nestle amongst the fertile, rolling hills of Perthshire. This area of Scotland, not too far from Glasgow or Edinburgh and their international airports, is popular not only with walkers and those enjoying the beauty of the countryside, but also with field sports lovers. The River Tay and many game estates pepper the area. Ballathie sits at the epicentre of this activity, with its own stretch of the River for fishermen (and women), and many guests enjoying stalking or clay shooting here and at nearby estates including the royal trio of Scone, Athol and Glamis. But my interest, as always, is more in Ballathie’s foodie credentials and here it does rather well with young chef Scott Scorer, ex-Gleneagles, in charge since 2012. Ballathie lies within a substantial estate which as well as herds of pedigree Aberdeen-Angus and Charolais cattle, has its own stalking beat and hundreds of hectares of arable farming. It is peaceful and secluded, and yet with 41 rooms it is large enough to cater for corporate and banqueting events. It was recently awarded ‘Country Wedding Venue of the Year’. Formerly home to textile tycoon Sir Stewart Coates of Paisley, the house was built in 1880 and converted to a hotel in 1972, but it is still privately owned (owner John Robert Milligan was much in evidence on my visit, keeping a watchful eye on the operation). The classic room I stayed in was comfortable rather than luxurious. Prices reflect that, and whilst furniture is a mix of antique pieces and more functional fitments, beds are large and beautifully cosy and there was copious hot water in the bathrooms. Ballathie is a great place to relax and unwind, kicking off your walking boots and having a drink in the fire-lit lounge before dinner, so the clean and comfortable classic rooms will appeal to all except those expecting the grandest 5* standards. From photographs, suites and four-poster rooms appear to be significantly more luxe. I visited Ballathie primarily to attend a dinner based around the Champagnes of Delamotte and Salon, and so ate in what was essentially a private room for the evening (though the hotel was full and the main dining room packed). Scott Scorer and his team cooked for the entire hotel however, as they did for breakfast next morning, so this was still a fair test of the kitchen. Ballathie currently has two AA rosettes, but on the evidence my meal it deserves more. ‘Scotland’s larder’ is a bit of cliché I know, but that’s exactly what the lush countryside of Perthshire offers, with venison and game birds from the nearby estates, trout and salmon from the Tay, prime beef and lamb from pastureland and soft fruits and veg in abundance. Ballathie has its own small kitchen garden with home-grown herbs and vegetables too. We kicked things off with one the best dishes of a pretty faultless meal: rabbit wellington, with Scottish langoustines, apple and watercress salad. The pure white rabbit meat melted in the mouth, set inside a delicate shell of puff pastry and sweetened and heightened by the plump langoustine meat. The little micro-herb and apple salad added lovely cleansing acidity and flavour. The second course was wonderfully fresh and a superb use of another prime Scottish ingredient: cannelloni of crab from nearby Killin, on a salad of compressed watermelon with a playful but flavoursome cucumber jelly. This was a special Champagne dinner and the food and wine matches were heavenly, which extended to the main course of roast monkfish tail with razor clams, Swiss chard and sea vegetables. The kitchen kept this relatively simple, emphasising the ozone freshness of the dish, the meatiness of the fish offset by the sweet clams and ferrous bite of the chard. Very good cheeses followed – Scottish and French – along with biscuits, grapes and quince jelly. To round off a meal that was essentially light, fizz-friendly, but full of vivid flavour, a dessert of poached rhubarb with a mascarpone vanilla cream and gingerbread croutons: all at once sharp, sweet, silky, spicy and crunchy, and a delight with a glass of rosé Champagne. 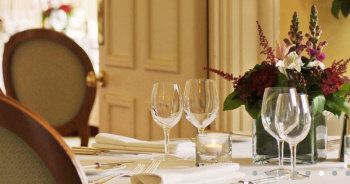 Scotland is graced with many excellent country house hotels, many of which have excellent kitchens. 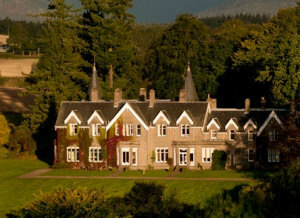 In super-luxurious hideaways like Airds, Isle of Eriska or Inverlochy Castle that comes at a significant price. At Ballathie, off-season rates can be £200 for a comfortable classic room, dinner and an excellent and substantial breakfast for two. But hotels are about more than price: the Ballathie team is doing a wonderful job of welcoming guests into a real home from home atmosphere, and both Chef Scott Scorer and General Manager Jody Marshall are clearly ambitious and detail-driven in offering a food and wine experience of the highest order. Next morning, Jody took me on a tour of the wine cellar pointing out some pretty serious bottles he has laid down for the future, as well as those from the well constructed main wine list. 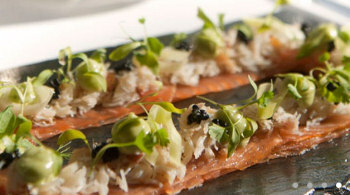 Ballathie is well worth foodie consideration for a Perthshire break.